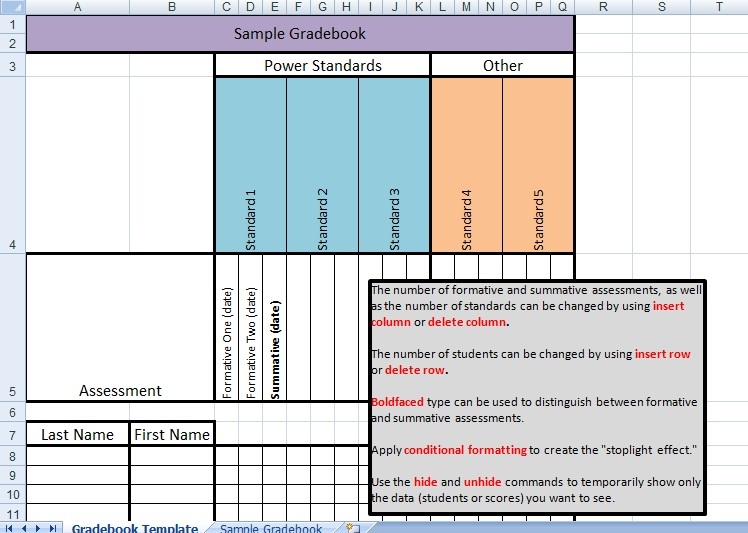 Your gradebook looks EXCELLENT! I found out about your blog and gradebook via Twitter and I would LOVE to download it and play with it. However, I must be doing something wrong? I have Excel 2007 and I tried extracting all files, but it's not popping up right. Am I doing something wrong? If you could let me know, that would be great! Thanks! You should be able to do a "Save As..." The file has a different extension (.xlsm) from most excel files because it is macro-enabled. When you first open the file, there should be a banner that appears just below the toolbar. The banner will have a security warning about the macro---just click it to enable the macro and things should run fine from there. If you've tried all that and are still struggling, send me an email and I will attach the file to a reply. It looks great! Can't wait to play around with it! Thanks again! This looks like a fantastic system. How has your record-keeping been going with it? Do you use this to report to students or parents? I'm not in the classroom this year, however, I did use a file similar to this when I was in the classroom. There were no sparklines then, but I did use it to make lots of other graphs and charts. I also liked the ability to keep various spreadsheets of data in one place. I did use it for reports to students and parents. OK, I am about to prove I'm too technology illiterate to attempt this system, but I loved how it looked in your blog...so I'll try anyway. I downloaded the file which has four subfolders (_rels, customUI,docProps, xl) and a file called [Content_Types] but can't figure out how to proceed from there. None of the files seem to be opening as excel docs. Sounds like the file downloaded oddly---not your fault at all. Sorry you had some problems. Send me a note to "the_science_goddess[at]yahoo[dot]com"
I'll email you the workbook directly and you should be good to go! I have tried to download this file, however it is not opening the way it should. Would it be to much to ask to send it as an attachment. I would really appreciate it. thanks for all you do. There are no more downloads on this page. If you will let me know which of the gradebooks you want (list posted here) and send me your email address, I can get it to you as an attachment.